Due to a recent late winter storm we have been off line for several days. I will be adding further posts on antique and estate cufflinks in the next several weeks. 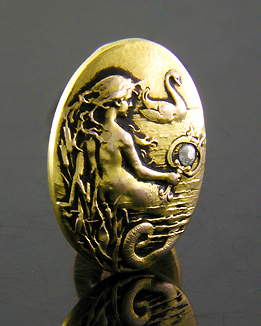 Meanwhile, above is a beautiful Art Nouveau cufflink depicting a more serene, warmer scene. Crafted by Krementz & Co. in 14kt gold, circa 1900.